(Edited August 22, 2018)—The report generated by this solution now includes SourceIp and FromAddress fields. It also includes an Export to Excel function. We updated the screenshot below to show the new interface. (Edited July 11, 2017)—We added a link to a CloudFormation stack in the “Building a Daily Dashboard” section. You can use the CloudFormation stack to create the daily dashboard in a few simple steps. Bounce and complaint rates can have a negative impact on your sender reputation, and a bad sender reputation makes it less likely that the emails you send will reach your recipients’ inboxes. Further, if your bounce or complaint rate is too high, we may have to suspend your Amazon SES account to protect other users. For these reasons, it is very important that you have a process in place to remove email addresses that have bounced or complained from your recipient list. This article includes background information about bounces and complaints. It also discusses a sample solution that you can use to keep track of the bounce and complaint notifications that you receive. A hard bounce occurs when a persistent issue prevents the message from being delivered. Hard bounces can occur when the recipient’s email address does not exist or the receiving domain does not exist. When an email hard bounces, it means that the recipient did not receive the message, and Amazon SES will no longer attempt to deliver the message. A soft bounce occurs when a temporary issue prevents a message from being delivered. Soft bounces can occur when the recipient’s mailbox is full, when the connection to the receiving email server times out, or when there are too many simultaneous connections to the receiving mail server. When an email soft bounces, Amazon will attempt to redeliver it. If the issue persists, Amazon SES will stop trying to deliver the message, and the soft bounce will be converted to a hard bounce. To learn more about bounces, see the Amazon SES Bounce FAQ in the Amazon SES Developer Guide. When an email recipient clicks the Mark as Spam (or similar) button in his or her email client, the ISP records the event as a complaint. If the emails that you send generate too many of these complaint events, the ISP may conclude that you’re sending spam. Many ISPs provide feedback loops, in which the ISP provides you with information about the message that generated the complaint event. For more information about complaints, see the Amazon SES Complaint FAQ in the Amazon SES Developer Guide. We recently added a section to the Amazon SES Developer Guide that documents the process of creating a daily bounce and complaint tracking dashboard. You can find the procedures for creating this daily dashboard at http://docs.aws.amazon.com/ses/latest/DeveloperGuide/bouncecomplaintdashboard.html. Alternatively, you can download our CloudFormation stack to implement this solution with just a few clicks. To learn more about deploying CloudFormation stacks, see “Get Started” in the AWS CloudFormation User Guide. This solution uses several AWS components—including Simple Notification Service (SNS), Simple Queue Service (SQS), Identity and Access Management (IAM), Simple Storage Service (S3), Lambda, and CloudWatch—to create a dashboard that is emailed to you every day. The daily dashboard, illustrated in the following image, contains a list of the messages that generated bounces and complaints over the past 24 hours. This solution uses SNS to track bounce and complaint notifications. Those notifications are then collected in an SQS queue. 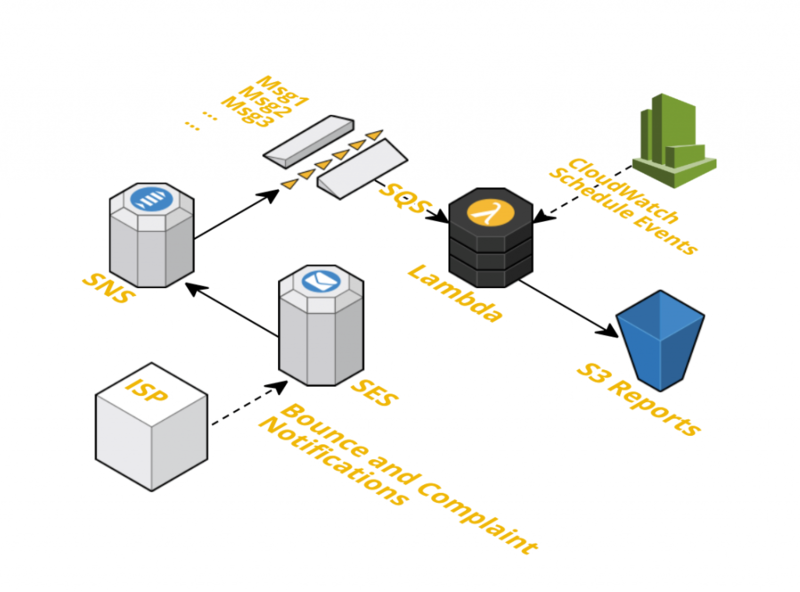 A CloudWatch trigger initiates a Lambda function, which collects the notification events from SQS, processes them, publishes a dashboard to an S3 bucket, and sends you an email when the dashboard is ready to view. The following image illustrates the architecture of this solution. When you receive the daily dashboard, you should use it to remove the addresses that hard bounced or complained from your recipient list. This measure will help protect your deliverability and inbox placement rates. This solution is just one method of tracking the bounces and complaints that you receive when sending email using Amazon SES. We hope you find this sample solution useful. If you have any questions about this solution, please leave a comment below, or start a discussion in the Amazon SES forum.